The Review Ballerina: Free Clothing! Seriously, Simple and $50 Worth for Free from Schoola! Free Clothing! Seriously, Simple and $50 Worth for Free from Schoola! First off, a huge thank you to Coffee for Mom for revealing this wonderful opportunity to me! 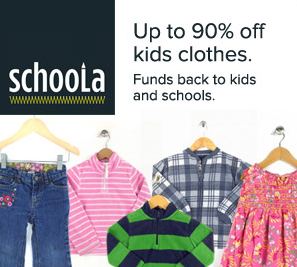 Schoola clothes offers quality clothing at up to 70% off retail with 40% of proceeds going to schools. They have some fantastic offers right now where you can get FREE clothes for your kids. They also have a smaller selection of accessories, women's clothing, and more. Seriously, I just got $50 worth of clothing for Olivia for FREE! How does it work you say? Well, it's quite simple! 1. Click here then at the top, click "Join/Sign In". Make sure you sign up at this link! Yes, this is an affiliate link, but with it you get a $15 credit up front so you don't want to click away trust me. 2. Once you get signed up, go start searching! Anything you see that is "Good" is what I chose, and as long as it's not "New with tags", you can choose it! It'll be free at the end trust me. You get a $10 credit automatically added to your account. 3. Add $50 worth of clothes to your cart, this gets you FREE clothes. I personally decided not to choose anything that was not "Good". I'm not a fan of the word "Blemished" but you can see the images to know if you want to choose them. 4. Use code APPORTUNITY for 50% off at check-out. 5. You do have to enter your credit card info, but this is a secure site, and I didn't see any charges or anything like a test $1.00 or anything. If you don’t see something you like now, go through the steps above to get the credits and save them for later. Schoola is always switching with more and more clothes, and then you get a referral link to share this deal with others to score a $15 credit for even more. With Christmas right around the corner, this could be a huge score for you, family members, and more! Once you're done, let me know what you got and how much you saved! Enjoy everyone!